Save for the wall-mounted outdoor cross and the signs advertising various worship times, it is not difficult to confuse Glad Tidings Church with one of the many utilitarian office buildings that line Quadra Street near the Save-On-Foods Memorial Centre. Anyone unfamiliar with the area might drive right past it, especially during the dark of winter. 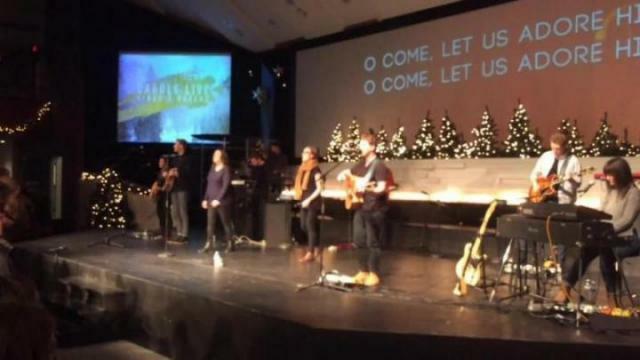 But the architectural blandness of the area belies the diversity of people — visible minorities, younger adults and families with children — who had streamed through Glad Tidings’ doors on the last Sunday in November to pack its two-tiered auditorium to see the church’s band, GT Music, perform their new album of Christmas carols titled Kings and Queens. As late-arriving stragglers were scrambling for seating, the anticipation among audience member was palatable. It found release when the dozen or so musicians on stage launched into the album’s opening song, Wonderful Counselor, whose slow-burning opening eventually morphed into a crescendo during which many if not most of the audience members were swinging, swaying and singing along to the lyrics displayed on a large video screen behind the band, itself illuminated by a whole kaleidoscope of coloured lights. Following this original composition, the band performed a series of carols with familiar names that nonetheless departed significantly from traditional interpretations of the original material. Glad Tidings’ worship pastor Luke Stones, who has been the church’s music director for 10 years, says the album’s material had been floating around in various forms for years, when the band experienced what he called was a “snap-the-finger, light bulb moment” that saw the band get serious about recording an album. Carols, he says, can help build community, because of their accessibility and familiarity. “I would say a large portion of the general population of Victoria would have some history with the songs that we are singing, some nostalgia,“ he says. Since most of the material was in the public domain, Stones and his collaborators did not have to spend time in the writing room to produce new material. But they did rework many of the songs, changing chords or even melodies along the way. Leaving aside their religious messaging, some of the songs on the album could easily appear on a compilation of contemporary independent music and the synthesis that defines the album could easily strike outsiders as a larger point about Glad Tidings itself: it carries forward an old message in a way that appears conscious of and comfortable with modern sensibilities. A desire for do-it-yourself originality also infuses the actual production of the album. Stones says the band could have sought outside expertise, but chose otherwise, especially since it plans to produce more albums in the future. The album, he says, reflects the sound of the church, where music plays an important role in connecting worshippers with each other. “Our team at large, not just the group on the record, is very passionate about music and the intersection between music and our faith is just really, really core,” he says.